Last year end of May, Sadiq Alam and Tiel Aisha Ansari jointly hosted the 1st Edition of Online Sufi Poetry Carnival. 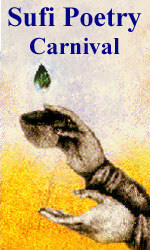 The idea of a Blog Carnival is a collection of blog posts/ site links on a specific subject/ theme. We are happy to announce that the 2nd Online Sufi Poetry Carnival will be jointly hosted at Inspirations and Creative Thoughts, Courts of Lions and Abdur Rahman's Corner sites on August 7th, 2008. The past round's theme was "Celebrating Divine Love" and this time around it is "Knocking from Inside". Sufi Dervishes are people who live at the threshold of this world and the next, between the visible world and the unseen realm. The truest and deepest expressions of sufi poetry arrive from lived experiences within and it's the ecstasy of soul that knocks from inside on the door of our external world. Daniel Abdal Hayy Moore once expressed: "the province of poetry is a private ecstasy made public." I've been knocking from inside. 2nd Online Sufi Poetry Carnival is an open invitation to express the pristine state of bewilderment, it is an invitation to make your private ecstasy public. You are welcomed and encouraged to participate with poetry of your own. The theme being said, you don't have to be a traditional or initiated sufi to participate. In the realm of spirituality, the state of bewilderment is a natural state of all poets of all ages. It has no boundaries or specific traditions. The only courage needed is the courage to make the private divine ecstasy public. Once that's done, jump into the Caravan and our destination shall be the Tavern of Bewilderment. There Inshallah, we shall rejoice and celebrate each other's 'knocking' from 'inside'. Also in this edition we are inspired and shall celebrate the publication of Tiel Aisha Ansari's recently published beautiful book titled, "Knocking from Inside". Please submit your poetry by July 25th. The Carnival will be up on August 7th, God willing. If you do have a blog or website, you can submit a direct link of your poem at Sufi Poetry Carnival. [visit Blog Carnival submission page, scroll down to fill up the form]. or directly send the link to our email. In case you don't have a blog or website but would like to be included, you can email your submission to this email address (mysticsaint@gmail.com) with a subject line, "Sufi Poetry Carnival"